I forget precisely when/where I first heard of Greg Cravens, but I do know that it was in reference to his webcomic Hubris. I know that because when I met him in person some time later, he mentioned working on the newspaper strip The Buckets, which I was wholly unfamiliar with at the time. (The strip debuted in 1990, just as I lost access to a regular newspaper. 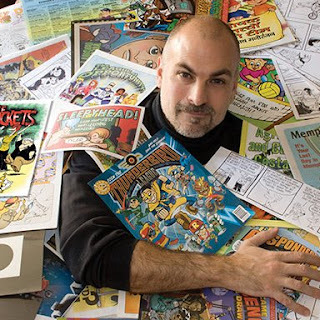 Cravens started working on it in 2000 as its originator Scott Stantis bowed out to focus on Prickly City.) When I learned Cravens was working on both a webcomic and a newspaper strip, it really stood out for me because that essentially does not happen. Rina Piccolo of Tina's Groove tried it in 2010, but couldn't make the economics work. Julie Larson toyed with the idea around the same time, but couldn't manage to self-syndicate her existing The Dinette Set, much less branch out into a full webcomics model. (She retired from comics entirely last year.) Not to mention in-strip jabs and snide interview comments about webcomics generally from the likes Brian (Hi and Lois) Walker, Wiley (Non Sequitur) Miller, and Stephan (Pearls Before Swine) Pastis. There just seemed to be this huge gulf between newspaper cartoonists and webcomics. So how did Cravens become seemingly the only cartoonist to straddle both sides of that divide? Yesterday, he posted this piece in which he muses about being "an analog cartoonist in a digital world." He attributes much of split between these two cartooning worlds to being born in 1965 -- the cutoff year between Baby Boomers and Gen Xers. He grew up getting the last vestiges of being completely analog and the first glimpses of a society going digital. We have a foot in either place. I still draw a newspaper comic strip (The Buckets) for which newspaper income is declining and web income is, slowly, increasing. But in a panic that I’d be left behind, sweatily poking a gnarled finger on whatever will replace the iPad and swearing “Gol-darn” and “Dagnabbit”, I started a webcomic (hubriscomics.com) so I’d HAVE to learn to keep up. Cravens didn't just look at webcomics and say, "Huh. That might be an interesting thing to try." He looked at webcomics and said, "OH SNAP! I need to learn this, like, yesterday!" I think it's that willingness to dive in (even if it's done out of fear of falling behind) that doesn't seem to be universal among cartoonists of that late Baby Boomer/early Gen X cohort. It's not only seeing those changes taking place, but seeing a need to act on them before being overtaken. Maybe it's because Cravens saw his own father face that "sorry, we're letting you go so we don't have to pay a pension" change in the workplace that showed him first-hand what happens with career obsolescence. Maybe there's something else. Age certainly has something to do with it, but only because older generations didn't experience dramatic corporate shifts like that. If your dads and uncles managed to retire from the same place they'd worked for 40 years, maybe that panic Cravens feels wouldn't be as visceral to you, even if you were born a decade later. But in any event, Cravens is a great cartoonist to watch, I think. He's got a handle on two notably different aspects of cartooning that I don't think I've seen anywhere else. (Brad Guigar of Evil Inc kind of did until recently, but while he did work for a newspaper, he didn't quite nail the nationally syndicated cartoonist angle.) He certainly doesn't maintain a model that can be easily emulated (if at all) but he's definitely got a perspective that can't be shared from anyone else. I'm Bill Holbrook, and a good friend of Greg's. I've been doing On the Fastrack for King Features since 1984. In 1995 I created Kevin & Kell for the web, which is now the Internet's longest running webcomics.